The spaghetti western was born in the first half of the sixties and lasted until the second half of the seventies. It got its name from the fact that most of them were directed and produced by Italians, often in collaboration with other European countries, especially Spain and Germany. The name ‘spaghetti western’ originally was a depreciative term, given by foreign critics to these films because they thought they were inferior to American westerns. Most of the films were made with low budgets, but several still managed to be innovative and artistic, although at the time they didn’t get much recognition, even in Europe. 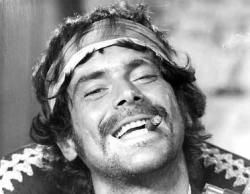 In the eighties the reputation of the genre grew and today the term is no longer used disparagingly, although some Italians still prefer to call the films western all’italiana (westerns Italian style). In Japan they are called Macaroni westerns, in Germany Italowestern. 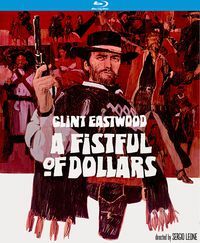 It’s often believed that the genre arose in response to the enormous success of Sergio Leone’s A Fistful of Dollars (1964), an adaptation of a Japanese Samurai movie called Yojimbo (Akira Kurosawa, 1961). But a handful of westerns were made in Italy before Leone redefined the genre, and the Italians were not the first to make westerns in Europe in the sixties. In Germany a series of immensely successful westerns based on the works of Karl May had been produced, and the first European western that had at least some of the right ingredients to be called a ‘spaghetti western’, was made without Italian input, being a British-Spanish co-production: The Savage Guns (Michael Carreras, 1962). 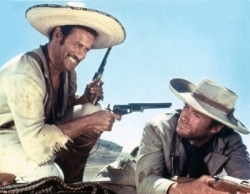 But it sure was Sergio Leone who defined the look and attitude of the genre with his first western and the two that soon were to follow:For a Few Dollars more (1965) and The Good, the Bad and the Ugly (1966). Together these films are called ‘The Dollars Trilogy’. Leone’s West was a dusty wasteland of whitewashed villages, howling winds, scraggy dogs and cynical heroes, as unshaven as the villains. 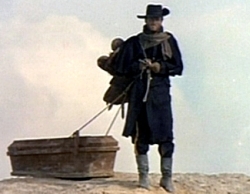 All three films were scored by Ennio Morricone, and his music was as unusual as Leone’s visuals: not only did he use instruments like the trumpet, the harp or the electric guitar, he also added whistle, cracking whips and gunshots to the concoction, described by a critic as a ‘rattlesnake in a drumkit’. Morricone went on to score over 30 Italian westerns and was a key factor in the genre's success. 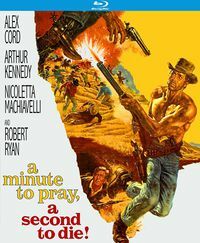 In general spaghetti westerns are more action oriented than their American counterparts. Dialogue is sparse and some critics have pointed out that they are constructed as operas, using the music as an illustrative ingredient of the narrative. 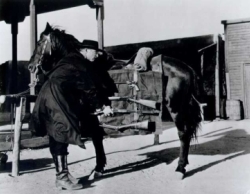 From a long time past westerns had been called ‘horse operas’, but like professor of cultural studies Christopher Frayling pointed out, it took the Italians to show what the term really meant. 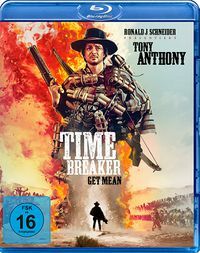 For the time of making many spaghetti westerns were quite violent, and several of them met with censorship problems, causing them to be cut or even banned in certain markets. 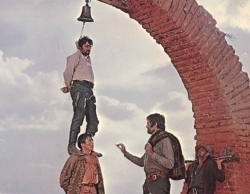 Many spaghetti westerns have an American-Mexican border setting and feature loud and sadistic Mexican bandits. The Civil War and its aftermath is a recurrent background. 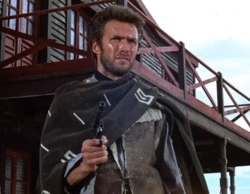 Instead of regular names such as Will Kane or Ethan Edwards, the heroes often have bizarre names like Ringo, Sartana, Sabata, Johnny Oro, Arizona Colt or Django. The genre is unmistakably a catholic genre (some other names in use are Hallelujah, Cemetery, Trinity or Holy Water Joe! ), with a visual style strongly influenced by the catholic iconography of, for instance, the crucifixion, the last supper or the ecce homo. The surreal extravanganza Django Kill! (Se sei vivo, spara, 1967), by Giulio Questi, a former assistant of Fellini (!) has a resurrected hero who witnesses a reflection of Judgment Day in a dusty western town. 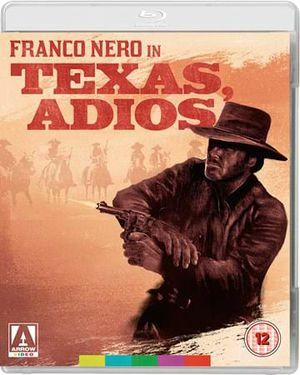 The outdoor scenes of many spaghetti westerns, especially those with a relatively higher budget, were shot in the Spain, in particular the the Tabernas desert of Almeria (Andalusia) and Colmenar Viejo and Hoyo de Manzanares (near Madrid). In Italy the province of Lazio (the surroundings of Rome) was a favourite location. Some spaghetti westerns were shot in the Alpes, North Africa or Israel. The indoor scenes were usually shot in the western towns of the Roman studios like Cinecittà or Elios. The Elios studios also had a ‘Mexican town’ next to the western town. Westerns had always been popular in Italy. A few Italian westerns had been produced during WWII, when the fascist government excluded American westerns from Italian cinemas, for instance Il Fanciullo del West (1942), by Giorgio Ferroni (who would direct several spaghetti westerns during the heydays of the genre). 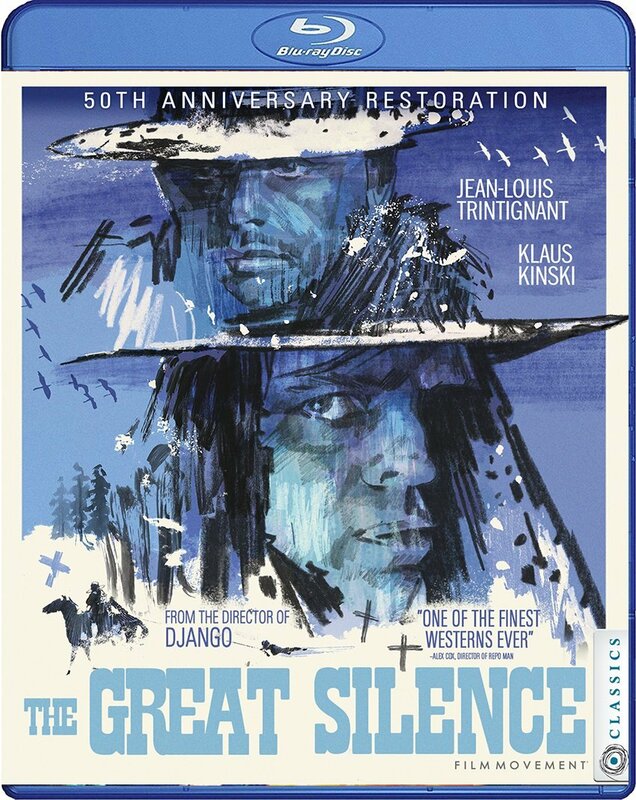 In the sixties the absence of American westerns in European cinemas had another reason: some of the genre’s most important directors such as John Ford and Anthony Mann were past their prime and the genre had been transferred to television. The Karl May movies had created a cultural and financial context for large scale production of western movies in Europe. 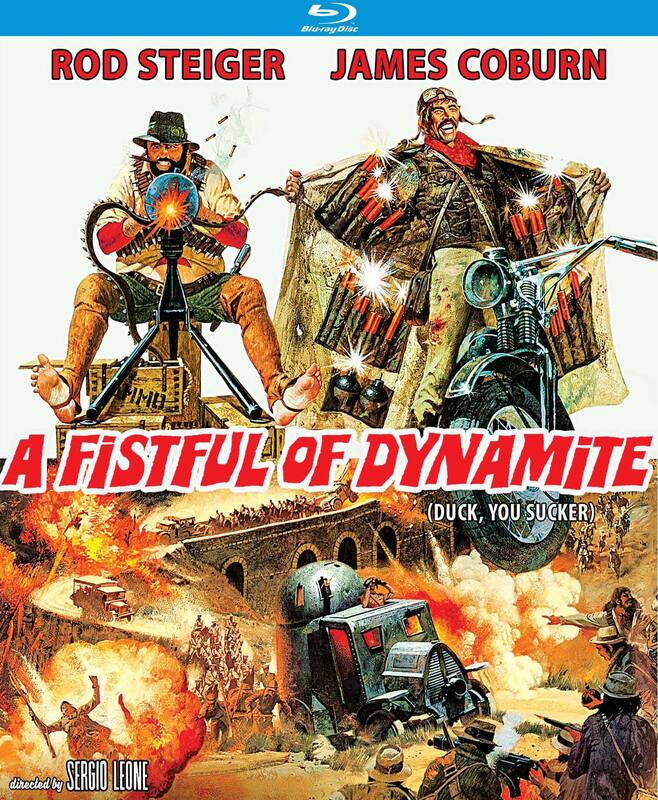 The early examples of Italian westerns produced in the sixties looked more or less like American B-westerns, with cast and crew hiding behind American sounding pseudonyms. 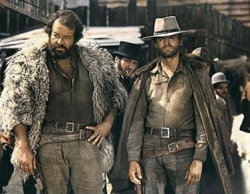 Leone’s A Fistfull of Dollars was produced simultaneously with Mario Caiano’s Pistols don’t argue. 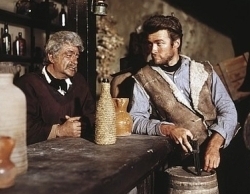 While Leone redefined the western genre, Caiano told a classic western story about sheriff Pat Garret, and where Caiano engaged an aging American actor (Rod Cameron), Leone chose a young television actor called Clint Eastwood. 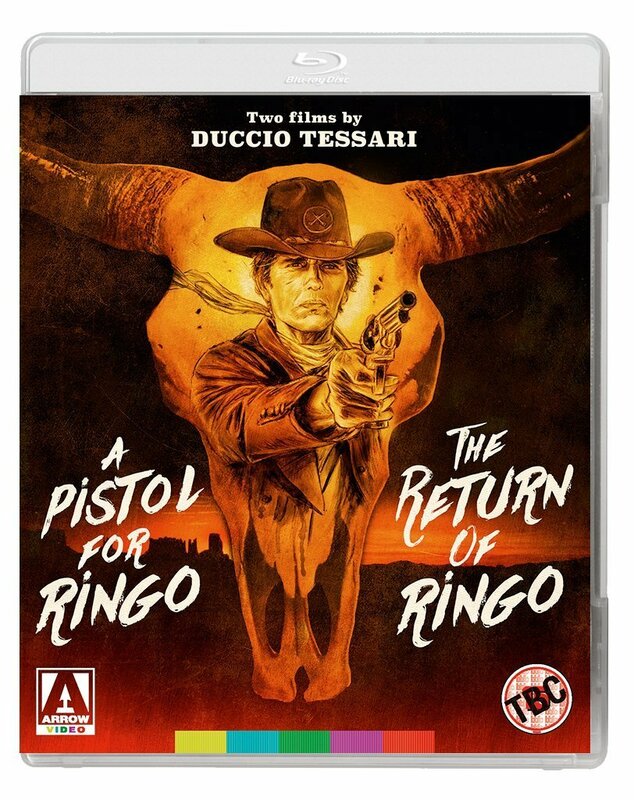 With the genre still in its infancy, most film produced in the transitional year 1965 mixed American with Italian influences, like Duccio Tessari’s Ringo movies, A pistol for Ringo and Return of Ringo, with Giuliano Gemma, the first Italian mega star of the genre. 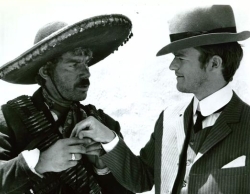 Leone still had signed the international version of A Fistfull of Dollars with the Americanized pseudonym Bob Robertson. 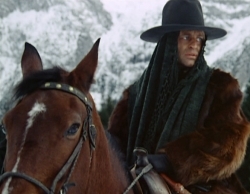 The first Italian to sign a spaghetti western with his own name would be Sergio Corbucci for Minnesota Clay (1965). In this rather brief period most of the films that have become classics were made. In 1966 Leone made The Good, the Bad and the Ugly, commonly regarded as the quintessential spaghetti western, and now considered by many to be the best western ever made. 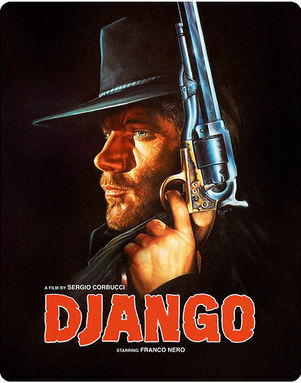 Another milestone was the groundbreaking Django by Sergio Corbucci (often called ‘the other Sergio’), which became the prototype of the vengeance tale, and spawned numerous films with ‘Django’ in its title. In 1968 these two directors brought the genre two more indisputable masterpieces: Leone made the legendry Once upon a Time in the West, the first spaghetti western to attract the attention of so-called ‘serious’ critics, and Corbucci made the devastating The Great Silence, which was entirely set in the snow and subverted virtually all genre conventions, among them the often heard cliché that in a western the good guy always wins.